These concerns have left behind a significant potential for further energy savings. Additionally, growing concerns about fossil fuels have put pressure on everyone to reduce natural gas use for heating, yet the cost for electric heat in most regions remains unreasonable. The solution to these problems is found in the refrigeration cycle. Although the system is driven by an electric compressor, the efficiency gain far outweighs the additional electrical costs. A typical refrigeration system can achieve between 5 and 10 (COP) units of heat energy per unit of electrical energy. This means the operating cost is lower even when the price of gas is 5 to 10 times that of electricity. As Figure 1 shows, the compressor extracts heat from the evaporator (blue coil) in heating mode. The evaporator cools the air in the exhaust air stream and condenses moisture, allowing for both sensible and latent heat recovery. The compressor upgrades the heat to the required temperature and rejects it into the condenser (red coil). This achieves an “active” form of energy recovery that is able to meet the supply air temperature set-point without the need for additional sources of new energy. With the design conditions shown, the outdoor air temperature is -4°F and the heating COP achieved is 5. What makes this heating system unique is the efficiency increases at part-load. This concept is similar to the “seasonal” efficiency achieved by conventional air-conditioners. When the outdoor air is 30 °F, the COP is nearly 8. By reducing the load, the suction pressure in the evaporator can be increased, reducing the lift on the compressor. Since the lift and load are reduced simultaneously, the situation also becomes ideal for using a variable speed compressor. In the summer, the refrigeration cycle can be reversed such that it cools the supply air while rejecting heat to the return air. SInce the return air from the building is typically cooler than the design ambient temperature, the efficiency in cooling mode is also improved. Figure 2: FreshAIR, manufactured by Advance Industrial Refrigeration. You can get detailed product information from the ventilation section of our website. Likely one of the most popular HVAC systems found in high rise residential, commercial, and industrial buildings is a chilled water system for cooling and a hot water system for heating. These systems are thought as two separate entities that operate independently. The issue with this philosophy is that for many hours of the year the chiller cools the process, rejecting waste heat outdoors, while the boiler consumes fuel to generate new heat. What does it take to turn this waste heat into something useful? A typical situation is shown in Figure 1. Chilled water and hot water are produced simultaneously. These instances of simultaneous heating and cooling can arise from heating domestic hot water in the summer months, or in buildings that require cooling year-round. Let’s assume the simultaneous load is 1.0 Mbtu/hr of chilled water (83 tons) and 1.6 Mbtu/hr of hot water. Figure 1: Typical cooling and heating system. The cooling system requires a chiller operating at 0.727 kw / ton and a cooling tower at 40.2 GPM / HP. For every 1.0 Mbtu of chilled water produced, the chiller and cooling tower consumes $7.27 and $0.55 of electricity respectively. A total cost of $7.82 / Mbtu’s of chilled water. The heating system requires an 85% efficient boiler operating with natural gas generating 160 F hot water. The operational cost is $16.00 / 1.6 Mbtu’s of hot water. The total cost to satisfy both loads simultaneously is $23.82 per hour of operation. 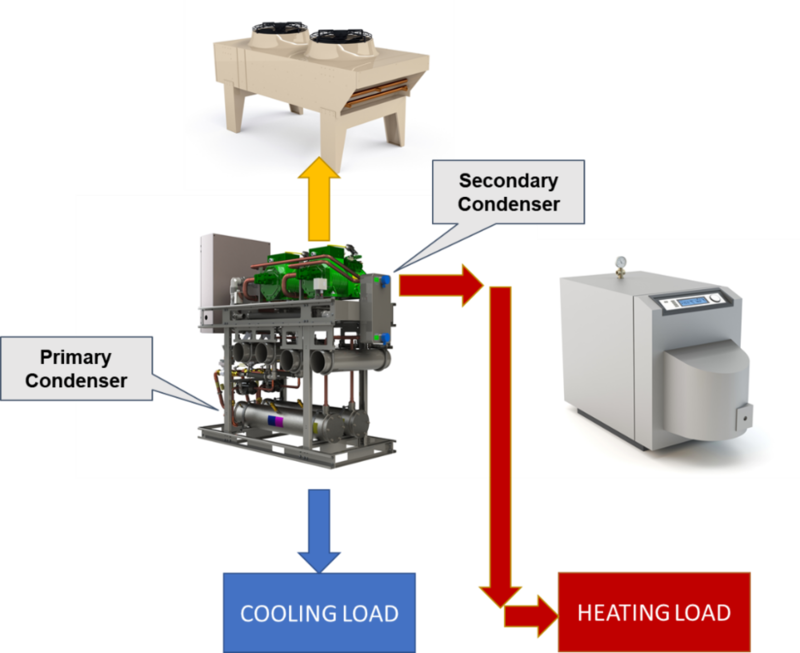 Figure 2: Heat recovery operation. With a heat recovery chiller as shown in Figure 2, the waste condenser heat is re-used to generate 160 F hot water. As a result, the chiller needs to work harder to produce the higher condenser water temperature and the electrical consumption of the compressor increases. The boiler and cooling tower are both off. The total cost to satisfy both loads simultaneously is $19.40 per hour of operation. If we compare this to the situation in Figure 1, the operation cost savings are $4.42 per hour, or 23%. If we had a situation where this simultaneous load existed continuously, the annual savings would be $38,719. With the theoretical savings now understood, the question becomes how can this be implemented in a realistic situation. With the simultaneous load constant, the savings and pay-back can easily be calculated. Figure 3: Building heating / cooling load profile. In Figure 3, the building has a cooling load profile shown by the blue curve. The load peaks in the summer time but some small amount of cooling is required through the winter months. We will assume this winter time minimum cooling load is 83 tons (1.0 Mbtu/hr). The building also has a heating load shown by the red curve. The heating load peaks in the winter but there is still some heating required in the summer (domestic hot water heating, for example). We will assume this minimum heating load is 1.6 Mbtu/hr. The area below both the red and the blue curves represent the total amount of energy available for heat recovery. Figure 4: Effect of heat recovery on building load profile. If we implement the heat recovery chiller previously discussed, the chiller will run continuously throughout the year, generating 83 tons of cooling and 1.6 Mbtu’s of heat. The reduction on the remaining cooling load is shown in Figure 4 with the green curve. This situation provides the maximum economic return when implementing heat recovery since the chiller operates continuously throughout the year. What if there is a situation where we cannot guarantee the need for heating and cooling at all times of the year? For example, a fluctuating domestic hot water load. The table below gives an example situation of a summer and winter load for a building. In the winter months, the cooling load is present and there is more than enough heating load to absorb the recovered heat energy. The issue becomes in the summer when the heating load fluctuates from 0 to 1.6 Mbtu/hr. If the hot water load is 0, there will be nowhere for the heat recovery chiller to reject its heat and it will not be able to produce cooling to satisfy the cooling load. There are two potential solutions to this problem. Size a stand-alone heat recovery chiller to generate 1.6 Mbtu/hr of hot water and 83 tons of cooling. Install another 200 ton chiller. This will ensure that 200 tons is available even when there is no hot water demand. Although the building only requires 200 tons, the total amount of chiller installed becomes 283 tons. Size a heat recovery chiller to generate 1.6 Mbtu/hr of hot water and 83 tons of cooling with primary / secondary condensers. The primary condenser rejects heat to the cooling tower and the secondary condenser rejects heat to the heating loop. Install a 117 ton standard chiller. The total amount of chiller installed is 200 tons. See Figure 5. Figure 5: Heat recovery chiller with primary/secondary condensers. The main benefit of option 2 is the cooling capacity from the heat recovery chiller can be included in the capacity of the entire chiller plant. This is because the heat recovery chiller will always be available regardless if heat recovery is needed or not. If there is no demand for hot water, the chiller can reject its heat to the cooling tower as needed. When the demand for hot water returns, the chiller with continue in heat recovery mode. With this solution, there is the obvious reduction in capital costs when considering a 200 ton plant versus a 283 ton plant. When installing a new chilled water system, the addition of heat recovery is simply the addition of a secondary condenser. There are other side benefits of a heat recovery system. In systems where the space heating boiler is also responsible for domestic hot water heating, the boiler is typically oversized for domestic hot water heating. The boiler tends to cycle on/ off considerably through the summer months. The addition of the heat recovery chiller can greatly reduce this cycling, improve the precision of the hot water set point and increase boiler life. If the heating boiler is driven by natural gas or other fossil fuels, the addition of the heat recovery chiller will reduce the amount of CO2 emissions from the boiler. The reduction in cooling tower use will increase cooling tower life expectancy. When heat is recovered and not rejected to the cooling tower, less water will be consumed. The amount of chemical water treatment is also reduced. Chiller heat recovery is an economically feasible solution that will produce significant operating cost reductions in a heating / cooling plant. As discussed, in a plant generating 160 F hot water and 44 F chilled water, the savings are 23%. If the building hot water temperature is lower – 140 F for example, the efficiency of the chiller is improved and the savings are even greater. Utilizing a chiller with a secondary condenser gives flexibility in situations where heating and cooling are not always present at every moment of the year. This can help exploit situations where heat recovery was previously not economical such as, apparent buildings, schools, and smaller commercial spaces. When a new chilled water plant is being considered, the addition of heat recovery can simply be the addition of the secondary condenser, condenser pump, and associated water piping. This helps keep capital costs low and improves the economic payback significantly. For more information about heat recovery chillers and chillers featuring a secondary heat recovery condenser, visit the ModulAIR page. Figure 6: Heat recovery chiller with primary/secondary condensers. Cooling tower efficiency: ASHRAE 90.1 40.2 GPM / HP, or 0.055 kw / ton of cooling load.